A sample code library project demostrating this approach can be downloaded here. 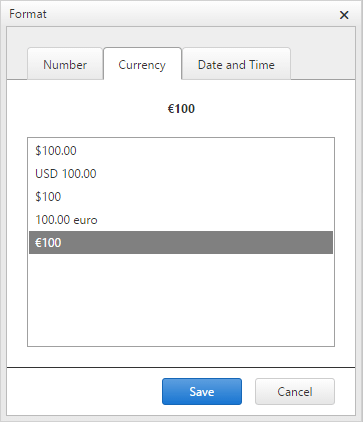 The following screenshot shows the result of modifying the user control and including two additional formatting options ("100.00 euro" and "€100") in the Currency tab. A format string consists of one or more sections, separated by semicolons. A section optionally specifies a color and a condition. The following example demonstrates how to display a number with up to three decimals. The following example demonstrates how to display positive numbers, or zero, in green, and negative numbers in red. The following example demonstrates how to display positive numbers in green, negative numbers in red, and the the "Zero" text in blue if the number is zero. This example is the same as the previous one, with the difference to display any possible text in the cell in magenta. Excel also supports a more flexible conditional formatting. The following example demonstrates how to display numbers greater than 100 in green, numbers less than minus 100 in yellow, and other numbers in cyan. In this case it is not clear whether only up to four sections are allowed, of which the last one must be text, while the Spreadsheet formatter allows for any number of conditional sections. 0 Digit placeholder. Use this to display insignificant zeroes. For example, 8.9 with the format 00.000 displays as 08.900. # Digit placeholder. This does not display insignificant zeroes. For example, 12.34 in the ###.### format displays as 12.34.
? Digit placeholder. It is similar to 0, but displays a space character instead of a zero. You can use this to align numbers by decimal point, but you should use a fixed-width font for this to be effective. , Thousands separator, or scale (see below). \ Escape the next character (display literally). _ Skip the width of the next character. "text" Includes a piece of text in the format. Characters inside will not be interpreted in any way, they will just output literally. @ Text placeholder. Will be replaced with the text in the cell. Note that the month and minute specifiers are ambiguous (m or mm). These strings are interpreted as a month number, unless preceded by an hour part (h or hh) in which case it displays minutes.